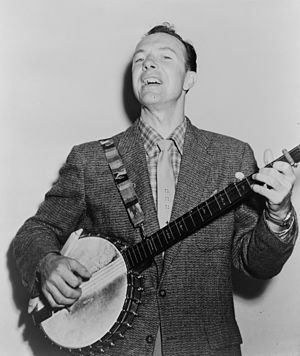 As an ethnomusicological nerd, I was alerted by the American Folklife Center’s facebook page that today is Pete Seeger’s birthday. What a great excuse to highlight some of Seeger’s amazing music! As a little lagniappe for you, here’s a three-minute interview clip of Seeger discussing his thoughts on The Byrds and their version of “Turn! Turn! Turn!”. I adore Pete’s version of ‘Polyushka Polye’. “This machine surrounds hate and forces it to surrender.” Happy Birthday, Pete!